…Then, it’s time to read on! (and some very successful 7-figure per year earners). acquire new clients EVERY month on total auto-pilot.. The way I’m going to show you is a much better, faster, smarter way! barely accepting any kinda help at all. It’s in your genes, I guess. One man army. Doing it all on your own. I know from deep experience that the SUCCESSFUL Advisors all enjoy ‘massive’ amounts of external help. (once you see the expert input (you’ll use it too). that you HAVE to figure it out all by yourself. Using Just these 4 Steps! If you’re already receiving a few new clients per month and seeing some small results from your lead gen campaigns, trust me these 4 steps can help you Accelerate the number of new clients you receive each month – instead of intermittent, erratic, inconsistent numbers of new clients. and have it all neatly organized for you to successfully implement. than the traditional system of lead generation! 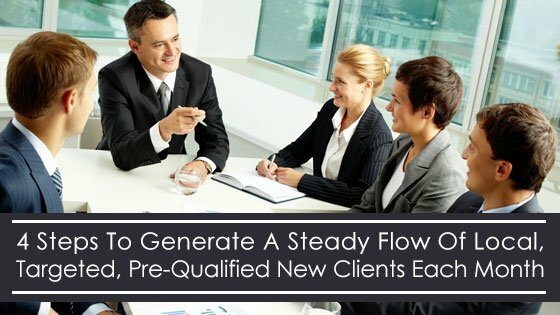 As I mentioned before, there are only FOUR things you need to do to start enjoying a steady flow of your dream clients…Who come to YOU – instead of you having to go to them. You don’t have to keep struggling to find new mid-to-high net worth clients. Putting the RIGHT compelling message in front of your target audience so they are compelled to call you and schedule an appointment with you. This is all about having the right message to market match. If you want high net worth clients, all of your communication must be targeted to them and solve their biggest problems/worries/fears. Providing your target audience and prospective new clients with information that clearly describes how and why you are ‘the best” at what you do will help separate you from the dime-a-dozen group of Advisors in your city. This is just as important (if not more important) than every other step. If the public thinks you are just like everyone else, there is no logical reason to seek you for your expertise. Showing your ideal clients how you can SOLVE their problem in the most effective and proprietary way possible is a huge part of the “magnet” that gets your ideal clients to hunt you down and beg you to accept them as your new client. to double or triple your income in 2016! So, the next time you feel “overwhelmed,” take a step back and ask yourself if you’re focusing on the 4 core steps needed to succeed at the highest level. Get those in place – and you’ll never have to worry about where your new clients are going to come from every month. Wondering how to get those 4 steps in place? Well, I’m in a super generous mood and I’m gonna over-deliver like I always do. So guess what? Let me make it super easy for you to learn HOW to implement the above 4 points with some super successful strategies too! but I’ll share these lead-generating steps with you for FREE! You have 10 months left to make this the best year you’ve ever had, right? If you do it right – you will achieve every goal you set for yourself …and then some! However, if you keep doing what you are currently doing – you will likely keep getting the same results. And I will be happy to reveal my secrets and step-by-step strategies to you on the call. Wouldn’t it be a multiple times more helpful to you if you could generate a steady flow of local, targeted, pre-qualified new clients every month knowing that 2X – 10X your impact, influence, business and income? The only other question is how much longer do you want to continue doing what you’re doing now? The Advisors I’ve coached have seen incredible results. 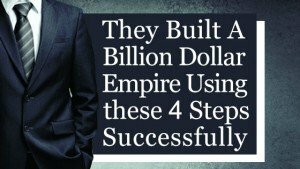 I helped my VIP client Larry Turell successfully generate $10M in new business in the first 6 months of working together….and 10’s of millions of dollars in additional business every year for the past 5 years. Plus, I helped Jack Singleton generate 3 or more high net worth clients for 10 of the last 12 months using my simple easy-to-implement strategies. And now, for the first time ever, I’m disclosing this PROVEN plan for you to put into action. Hundreds of Financial Advisors, (new and seasoned) apply every week to learn about how they can hire me as their Marketing Strategist. But not everyone who applies gets approved. But those who do get approved to be my client have used my strategies & techniques to generate a steady flow of new pre-qualified clients every month while working 25% – 50% LESS. Now you too can learn my proven strategies & techniques to automate the growth of your practice and income. Free One-on-One Business Growth Strategy Session right NOW. P.S. – Do you want to earn an additional $20,000 -$40,000 per month in income? If so, let’s talk so I can be certain that I can help you. Click Here to get started! 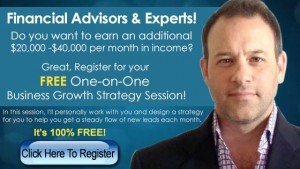 Next Most Financial Advisors would consider 18 leads in 1 month, a KILLER month!